It’s crazy, it’s zany, it’s growing like Topsy and it was invented here in Cattistock. The first Dorset Knob Throwing took place behind the Fox and Hounds in Cattistock. So next year we did it again with a bit of grub thrown in. Then it got too big for behind the pub so we moved to the Cattistock village play area. The date was fixed as the first Sunday in May. By this time the food element was expanding fast and you would be amazed at the number of Knob games fertile minds can dream up! It grew and it grew – a move to the football pitch followed. It took on the grand title of The Dorset Knob Throwing and Frome Valley Food Festival. And still it grew with over 5,000 visitors in 2016 almost swamping our village. 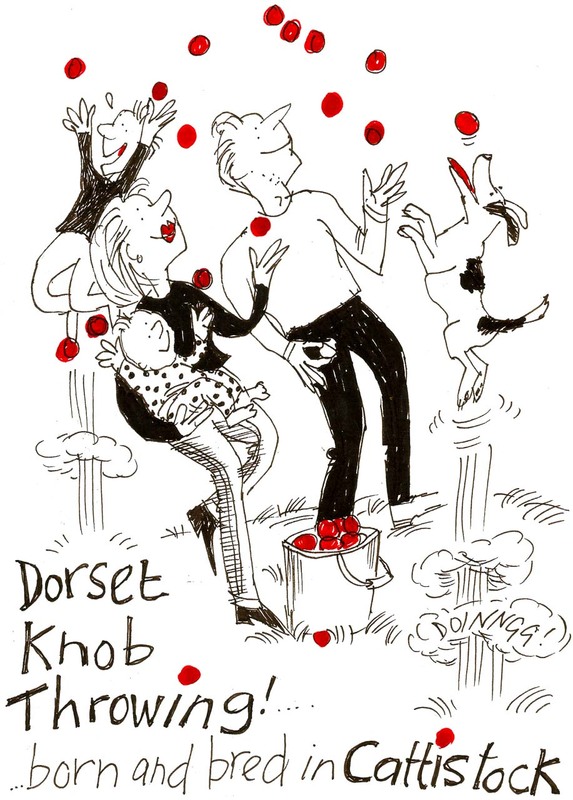 At this time the event boasted 75 food, craft and general interest stalls, 2 bars, 3 bands, loads of gazebos and marquees all centred around the Knob Arena which featured no less than 14 Dorset Knob Games of which the most popular remains the original Dorset Knob Throwing. And, before you ask, the Dorset Knob Throwing World Record stands at 29.4m! It’s now the fastest growing Food Festival in Dorset. It has moved to Kingston Maurward College just outside Dorchester but it’s still a Cattistock event, organised and manned by the village. Can I help? Yes, please, contact any of the Committee (names below). The money: It goes to: Cattistock and Chilfrome; also to Kingston Maurward College, our host for 2019; and to Weldmar Hospice, our charity partner for 2019. The Knob Team: Ian Gregory, Wayne Briggs, Sean Lavan, Patrick Nelson, Rupert Cake, Tara Potter, Meredith James, David Andrews, Phil Hallett, John Swatridge, Terry White, Ian Vine. Contact any of them if you want to know more.